Bakers and foodies, stand by, the Galvin brothers have announced the launch of the 6th annual Galvin Tarte Tatin Competition and are searching for the UK’s best tarte tatin. 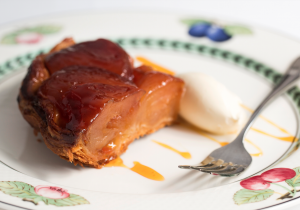 Gloriously sticky-sweet, indulgent and mouth-watering, the traditional French tarte tatin is the dessert of kings and a signature dish at the Michelin-starred Galvin La Chapelle in Spitalfields. Widely regarded as the perfect tarte tatin, the Galvin brothers, Chris and Jeff, have long since championed this traditional French dessert, passionately perfecting the recipe. The 10 best bakers will be invited to bring their desserts with them to the final at Galvin La Chapelle on the morning of Saturday 9thJune to be judged by Chris and Jeff Galvin and a collection of foodie friends and colleagues, including food critic Richard Vines, chocolatier William Curley, food writer Victoria Stewart, food writer Felicity Spector, Gavin at Windows pastry chef Veronica Martinez and Great BritishChefs Head of Marketing, Mecca Ibrahim. The winner will be crowned Galvin Tarte Tatin 2018 champion, winning tarte tatin for life at Galvin La Chapelle, an engraved traditional tarte tatin dish, a £100 Galvin voucher, a Magnum of Champagne and the Galvin a Cookbook de Luxe.